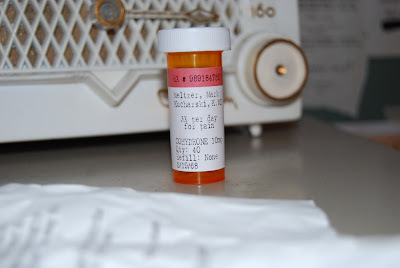 The "From the Mountains of Madness" project has been underway since the start of this blog, and odds are that it will never really be finished. Every couple of weeks I think of some new item to include or a minor refinement to the existing presentation, so it steadily keeps getting bigger and better over time. Much of what you'll find here, from the patches and pins to the faux photographs, is a direct result of that process of continual improvement. This installment is different from all the prior ones in that most of it was written by Robbert Folmer, a fan of both H. P. Lovecraft and fossils that was kind enough to offer his expertise. 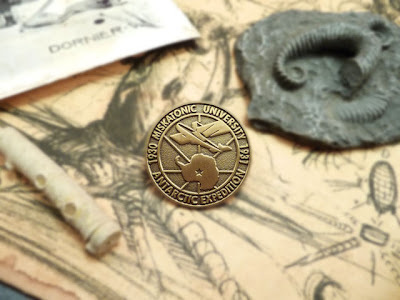 He's made a huge contribution with his advice on making the fossil samples that are part of the project consistent with both science and the text of "At the Mountains of Madness". Everything that follows was pieced together from our email exchange on the subject and Mr. Folmer deserves all the credit for making it available. The other day, while I was reading that day’s post, I noticed that the fossil casts in the pictures were not entirely consistent with the original story. In it are described Cambrian and Precambrian fossils, which would place them at about 600 million to a billion years ago, while the trilobite and ammonite you have on display are respectively approximately 400 million and 100 million years of age, which are no minor differences, if you’ll notice. It’s pretty inconsequential, and it’s not a nit I’d normally pick (even gently), but hey, we’re all weird hobbyists here, right? Right? While there isn’t that much on offer from the Cambrian period, as the late Precambrian and early Cambrian are really the periods when hard-shelled life got started, there are still a few pretty nice specimens for decent prices out there. 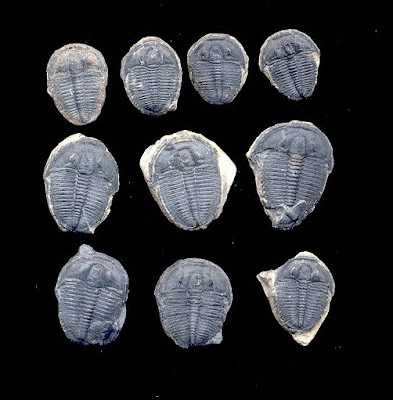 If you’re looking for trilobites, here’s a good place to find them: Trilobites.com. The specimens there are from the Wheeler Shale, a locality in Utah bursting with Cambrian fossils. The top category, labeled Elrathia, is really the poster child of the Wheeler Shale; it’s a pretty trilobite, albeit a bit small (I have one that’s 2 inches and that’s a whopper), but available and affordable. If you have any rock/gem stores in your neighbourhood, you should definitely pay them a visit, because if they do have a shelf of fossils in a dusty corner, odds are they’ll have a little pile of these trilobites, often for something around $5 a piece. Of course, the bigger, the more expensive. As for the crinoids... the earliest known specimens actually date from the Ordovician, which is the time period that follows directly after the Cambrian, about 480 to 440 million years ago. They were probably around before then, but you won’t find any fossils of that, I’m afraid. What you can do, as it would indeed be nice to have something like in the footage, is go to Crinoids.com and simply find yourself a nice specimen anyway. There’s a great variety in prices, starting at $10 and going up to well over $2000. 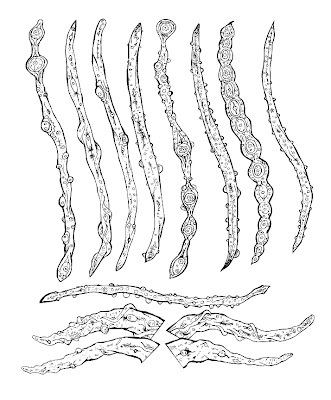 If I recall, the story also mentions ferns... which would also be impossible, as the only plants in the early Cambrian were simple, single-celled algae called stromatolites. 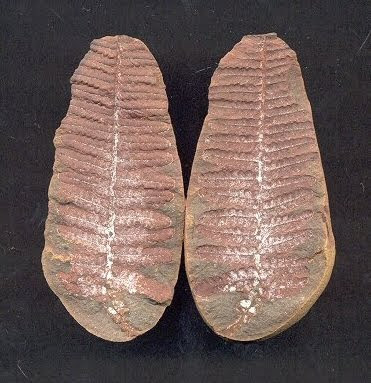 But if you’re willing to make the concession and buy some slightly younger fossils, I recommend FossilPlants.com. Carboniferous ferns go for cheap, and if you’re willing to spend $30, you’ll have a truly beautiful piece of rock. The only Cambrian fossils that you'll find for sale consistently are those from the Wheeler Shale. Every once in a while there will be a fossil for sale from a site called the Burgess Shale, but it's a rarity and the prices are high. Cambrian fossils have actually been found on Antarctica, but they’re all currently in the possession of scientific institutions. Other than the above, there are all sorts of sources to buy these fossils. If you Google "Elrathia kingi" you’ll find myriad sites selling them for as little as $5; same goes for crinoids, ferns, sea-urchins, ammonites, and all that once crawled and crawls no more. If you’re feeling confident you can give eBay a spin. Forgeries do abound there, but it’s mostly limited to the more spectacular species, such as Moroccan trilobites (like the one you have) and amber with insects in it, and things like these Cambrian trilobites are a pretty safe bet. I have a selection of Miskatonic patches and pins up on Ebay this week. 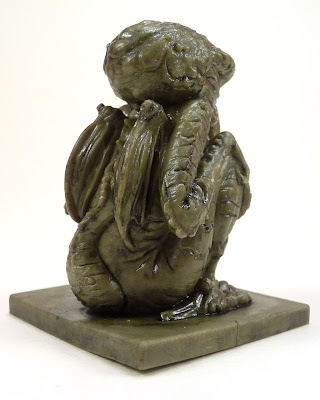 Next week's auctions should include some new bottled specimen's and more of the Dyer materials from "At the Mountains of Madness". 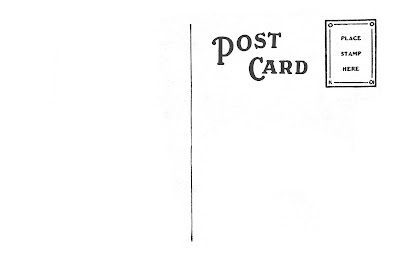 Continuing on with the postage theme, here's a handy postmark for your letters. Just click through for the high resolution version. 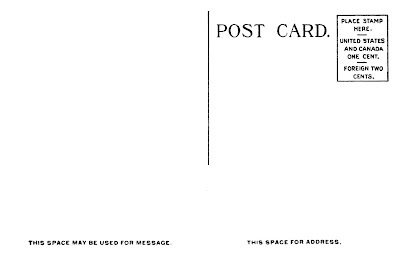 Most printers should be able to handle printing this on an envelope or postcard with postage already affixed by using the normal envelope feed. On a related note, if anyone with experience creating PDF's is reading this I could use some help. I think this graphic could be adapted for a PDF with data fields, making it infinitely customizable for whatever date a particular prop document needs. If you have any tips for doing that I'd appreciate any assistance you could provide. 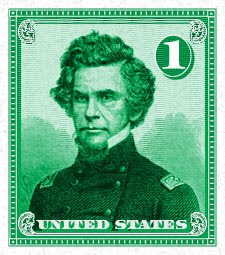 A postmark generator would be an extremely handy doodad. This is a totally time-wasting weekend link. Behold the genius of steampunk! This perfectly encapsulates why I loathe it so much. Some new props from Arkham have appeared, but in this case they're from Batman's Arkham Asylum, not Lovecraft's haunted city. 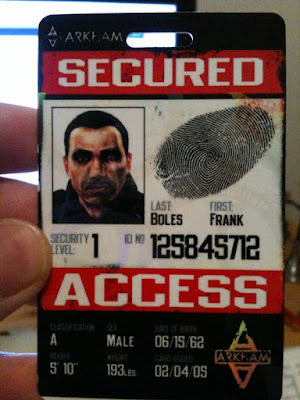 Giesen Cacho has a look at the elaborate props included in promotional copies of the new Batman: Arkham Asylum videogame. 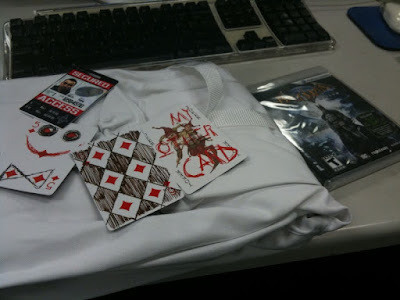 Sweet Jebus, they even included a straitjacket in the promotional package. How cool is that? "The Haunting" has been one of the introductory adventures in Chaosium's "Call of Cthulhu" RPG for years. Artist Cisticola is getting ready to take that scenario to the next level, with an impressive collection of maps and paper props that will soon be for sale. I'll try and bang out a few more and then see about cobbling them together in a PDF with cutting guides. Then you'll be able to print out a whole sheet of stamps at a time and really go to town. A commenter asked about where to find the scissors that produce the finished, perforated edge of a stamp. They should be available at your local craft store in the scrapbooking section. Different manufacturers produce both rotary trimmers and scissors with the appropriate edge, but I'm personally fond of Fiskars brand products. My significant other says you should stay away from the "Martha Stewart" branded items produced by EK Success at all costs- their trimmers suffer from shoddy construction and poor design. If you don't have a craft store nearby you can get the Fiskars Paper Edger Scissors for Stamps at Amazon . If you purchase the $1.93 scissors through the link two shiny pennies will fall into my wallet, so buy lots and lots of them. 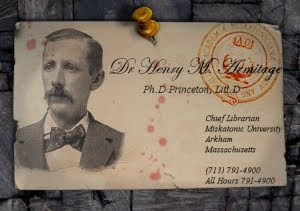 Postage stamps are a great finishing touch for the numerous bits of correspondence that pop up in Lovecraft's stories and "Call of Cthulhu" adventures. A huge chunk of "The Whisperer in Darkness" is a simple exchange of letters, while the climax of "The Shadow Out of Time" is set into motion by a note from Australia arriving in Arkham. Some of the most effective published scenarios start with the characters receiving a letter or package in the mail, reinforcing the postman's role as a harbinger of impending. For the ultimate in prop realism the best approach is to use actual stamps from the 20's and 30's. That might seem over the top, but it's easy to do and suprisingly affordable. 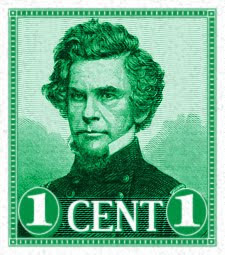 Ebay is filled with examples of nearly new period stamps that can be had for under a dollar, and cancelled stamps are available for just pennies. 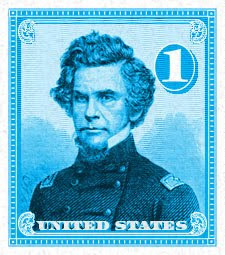 Click through for the high-res version- a 300 DPI JPG sized at .75 by .85 inches, one of the most common United States stamp sizes. While there's definitely room for improvement, I can't add the one thing that will instantly increase it's believability by an order of magnitude- a perforated edge. Those distinctive scalloped serrations are a vital part of the sensory identity of postage stamps. Luckily, the explosion of scrapbooking as a hobby means you'll find a variety of perforating scissors and cutting wheels in your nearest craft store. 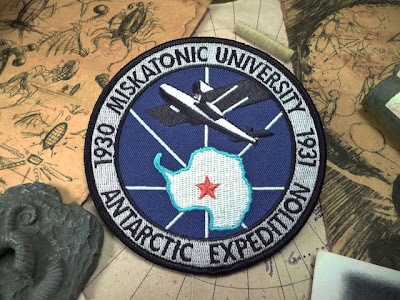 In 1930 an expedition from Miskatonic University arrived in the Antarctic. Shortly thereafter a remote survey camp began exploring a newly discovered chain of mountains and radioed back the details of an incredible discovery. Hours later, every man in the camp was dead. The controversy over what happened to the poor souls in that isolated outpost still rages today. Where they killed by a freakishly powerful storm, as the official inquiry ruled? Or were they the victims of a mass, homicidal rage induced by tainted food, as some have suggested? And what of the mysterious discovery they claimed to have made shortly before radio contact was lost? 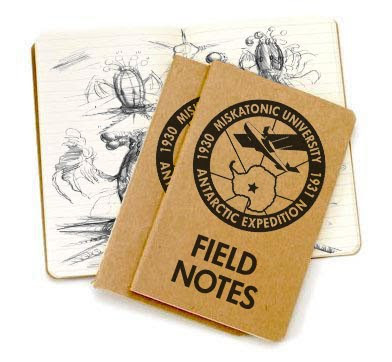 Those questions may never be answered, but now you can own a small piece of that ill-fated expedition's history. 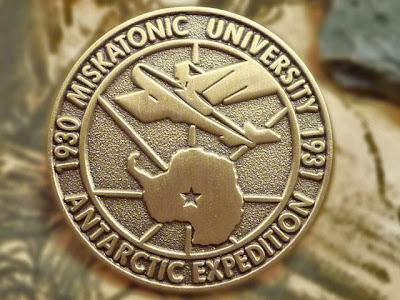 "Wings Over Antarctica" Miskatonic University Antarctic Expedition Patch. This 4" (10 cm) patch is embroidered on a tough cotton twill backing that will last for years of use, and the heat-sensitive adhesive makes it easy to iron it on to the garment of your choice. The "Wings Over Antarctica" logo is as historically accurate as possible. The deco-influenced design features a stylized Dornier Wal (or "Whale"), the aircraft actually used by the expedition in the story. The silhouette of Antarctica is correct for 1930, before the true boundaries of the ice floes had been mapped, and the font used was first available commercially in 1928. Reader's of the story should also appreciate the symbolism of using a five-pointed star to mark the expedition's ultimate destination. 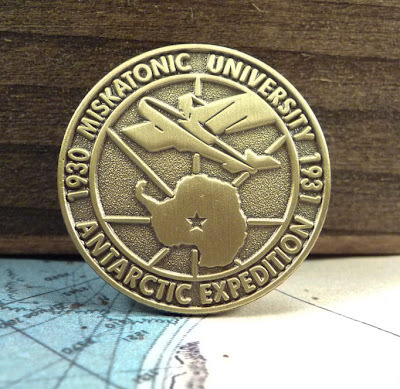 "Wings Over Antarctica" Miskatonic University Antarctic Expedition Lapel Pin. This handsome reproduction of the "Wings Over Antarctica" logo is 1" (2.5 cm) in diameter. Constructed of solid brass with an antiqued finish and a butterfly clasp backing. Both the patch and pin are short run, fan-based project based on H. P. Lovecraft's classic story "At the Mountains of Madness". There are a limited number available. Each patch is $5.95, pins are $8.95, and a set including one of each is available for $13.95. Shipping is calculated when you checkout using PayPal and should run around $2.00 to $2.50 for US orders and approximately $1 higher for international orders. You'll receive a prompt notification when your package has shipped, usually in less than 24 hours. If you would like to purchase multiple patches or pins please contact me at propnomicon@gmail.com about discounts for bulk purchases and shipping. Please feel free to email me if you have any other questions or concerns. Here's a super close-up shot of one of the Antarctic expedition lapel pins. I'll have some more shots when I put up the sale page tomorrow night. Here's a look at the first two "Life in Arkham" postcards- the Hotel Miskatonic and the Arkham Train Station. The whole idea behind these is that they can serve as both postcards and props. As postcards they're a fun little item that Lovecraft fans would appreciate getting in the mail. Just keep in mind to use an appropriate amount of postage, not the price back in the roaring 20's! 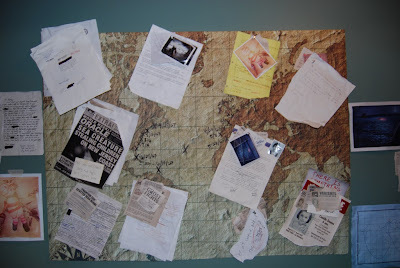 As props they're an immersive way to convey information to the players, either for messages sent to their characters directly or as documents discovered in the course of an investigation. Later this week I'll be posting some resources like faux stamps and postmarks to help with that, or you can use the whimsical stamps from the great folks at the H. P. Lovecraft Historical Society. The images on the cards are reproductions of actual 1922 postcards featuring the pastel overprinting style of color common at the time. 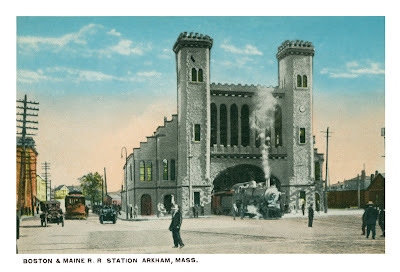 The "Arkham Train Station" is actually the old Boston and Maine station in Salem, Massachusetts, one that Lovecraft himself probably traveled through many a time. 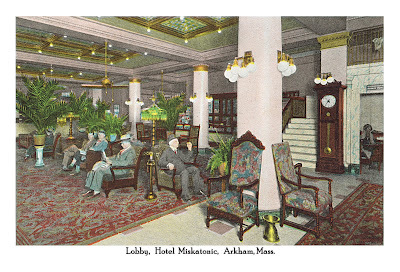 The "Hotel Miskatonic Lobby" is the main lobby of the Maryland Hotel, a stand-in I chose because of the fine appointments in the sitting area- marble floors and columns, polished brass lamps and ashtrays, and potted ferns scattered about. If you look closely at the photograph you'll also see two details that might be of relevance to investigators visiting the hotel, the house phone on the extreme right side of the picture and the newstand/sundries counter in the background. These will be for sale starting Sunday night for $1.00 apiece. If there's enough interest I'll go forward with more cards so that I can eventually offer a whole set of notable locations. That said, you're also free to download the images here and make your own postcards under the Creative Commons license down at the bottom of the page. That's right- help yourself. Click through on the thumbnails below and you'll find high resolution versions all ready to be printed out on cardstock for your personal, non-commercial use. Just provide an appropriate attribution for where they came from. From Galindorf, a bronze artifact with a troubling history. "This strange icon was found by chance by an anthropological archaeologist and kept for many years on a dusty shelf along with other bizarre, uncategorized finds. 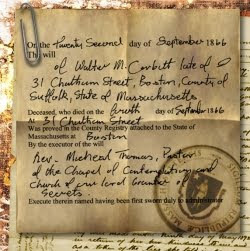 It was re-discovered after she was forcibly admitted to a women's institution." Both the Arkham postcards and the Antarctic expedition pins arrived today. The lapel pins turned out as good as I had hoped, while my worries about the coating on the postcards turned out to be overblown. Fountain pen ink and standard BIC ink both worked fine, but the ink from a gel-style pen did need a few minutes to air-dry. I'll have pictures of everything up tomorrow and Sunday night I'll post the PayPal page for purchase. 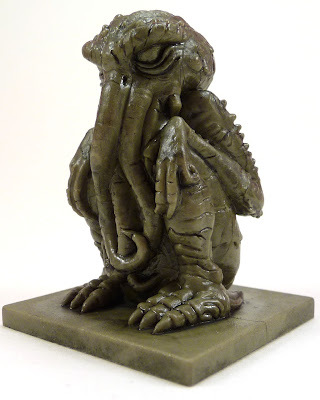 Alexi Bustamante, the sculptor behind the SOTA Toys Cthulhu figure from last year, has posted a preview of his current project . I'm steadily getting better at the fine details of my own works, but seeing what a *real* sculptor is capable of is humbling. At a small scale like this it takes expert technique and an intimate knowledge of your materials to produce work of that quality. I've gone through and deleted everything except T-shirts from my Zazzle store. I've had multiple complaints about the quality of the printing an non-apparel items like the mugs, so I'm searching for a more reliable provider for those items. From looking at a couple of Zazzle-oriented forums it appears my concerns aren't isolated. 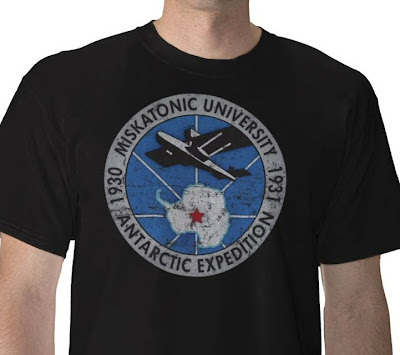 On the other hand, I've expanded the number of T-shirt designs by adding distressed versions of both the Australian and Antarctic Miskatonic expedition logos. I think the increased tonal range of the worn design looks better on the large canvas available on a T-shirt. Update: Woot! The distressed Australian Expedition Logo T-shirt is a "Featured Product" on the Zazzle homepage. My pathetic ego is most pleased. 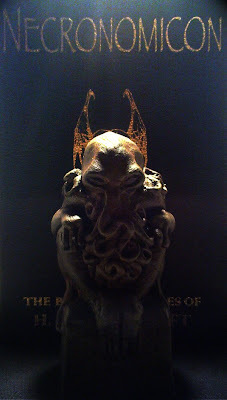 This dramatically lit Cthulhu idol was posted by Laroche on deviantART. Artist "Jacob P" has created an impressive retro-tech genetic engineering kit . This is the only "kit-style" prop project I've seen that manages to be both disturbing and funny at the same time. Browse through the rest of his blog and you'll find some amazing work, ranging from mounted fairy heads to a beautiful neo-victorian* blaster. *I can't bring myself to call what he does "steampunk", since it's actually, you know, good . 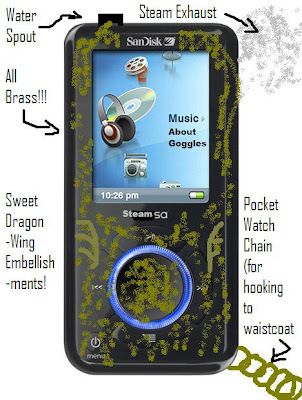 For every genuine artist like Tom Banwell or Datamancer lovingly crafting retro-tech devices there are two dozen hacks slapping together brass-colored junk from the goodwill store and calling it "steampunk". By sheer force of numbers the hacks won, effectively redefining the term into a label of derision. Yes, now that you ask, I am a cranky old man. Heh. So, my long awaited Bag of Cthulhu from Fantasy Flight Games finally arrived from Amazon. If you remember, I was a bit upset by the products much delayed release, but now that I actually have it in my hands I'm pretty happy. First, the good. 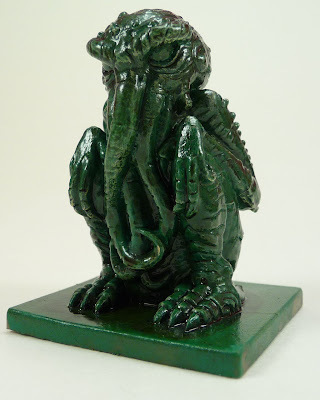 It's Cthulhu. Lots and lots of Cthulhu. 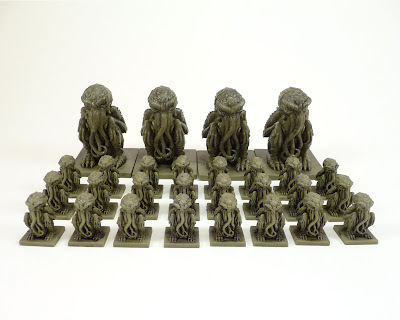 A veritable army of Cthulhu. You don't really appreciate just how freakin' many Cthulhu figures this includes until you see them all lined up outside of the package. You get 24 of the 20mm high figures and six of the larger 50mm ones. Two of the larger ones are missing from this picture because I used them for...experimental purposes. More about that later. "I've gotten mine from eBay ($11.99 + $3 s/h) and the detail is marvelous--the pictures do not lie. Finishing is a bit...erratic...as some have quite prominent mold lines and sprue marks and some look pristine with no indication that it isn't an original piece. I've come up with a few crafty ideas, but one thing to note is that they are formed of rather soft plastic, so they would not make a good keychain without some sort of reinforcement. Perhaps being embedded in a polyester resin..."
The finish is Kelly Green enamel with a light drybrushing of white and a final dip coat of golden oak oil stain. It took a couple of days to dry, but once it did the finish was like glass. That said, as a collection of game pieces the "Bag of Cthulhu" is a great deal. You get a ton of useful figures for a bargain basement price. I'm disappointed that the plastic FFG used short circuits my plans to recycle them in other projects, but, realistically, that's not a valid criticism. It's like giving a romance novel a bad review because it's not the gritty police procedural you were in the mood for. There's still a lot you can do with them outside their intended use, but these are, first and foremost, game counters. At that, they're exceptional. 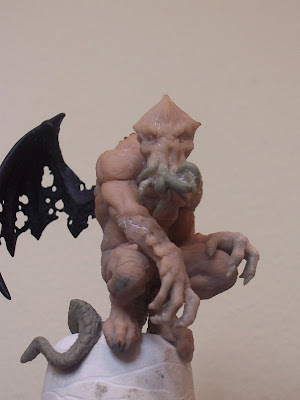 The always inventive Dave Lowe has a fantastic tutorial up on molding and casting the cheap and easy way. Here's a cheap, easy and I think, fun way to mold and cast small details with stuff you might already have around the house or find in any craft and hardware store. This method is not for those hoping to make perfect copies, but for those okay with slightly flawed details on a prop. For me it works, the aged and worn feel is perfect for Halloween. 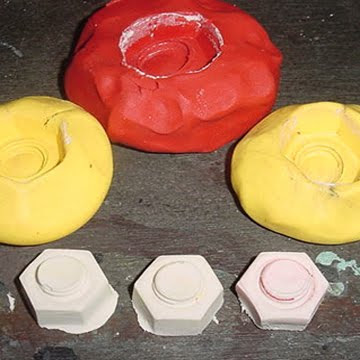 It's also a painless rookie introduction to molding and casting. Know that there will be trial and error doing this. It's just one of those things. You'll make a few screwed up ones. The good news is, it's so simple and easy that the results of your efforts are seen in minutes and just as quickly re-done if needed. This is a perfect technique for creating props like amulets, tablets, and engravings. It's not only absurdly cheap, but with a little creativity you can use items from around the house to form your master pattern in the mold. 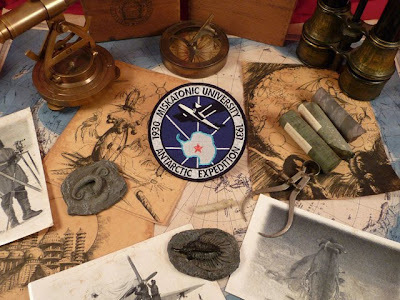 Later this week the first shipment of the Antarctic Expedition pins should arrive. Based on how great the Australian ones came out I'm really looking forward to showing them off. On the other hand, one of my side projects might turn out to be a disaster. I had the bright idea of doing some period Arkham postcards, but I may have made a very expensive error in choosing the company that printed them. I had assumed that not ordering a coating on the back of the cards meant I'd have a plain cardboard surface for the address and such. After talking with my print rep on Friday that doesn't seem to be the case- the cards are coated. That could be a problem, since there's a good chance that ink from a pen will smear before it dries unless you're extremely careful. It might seem trivial, but if I'm selling something I want it to be the best product possible. "Inexpensive" shouldn't mean "shoddy". Unfortunately, if the coating does turn out to be a problem I have no one but myself to blame. We live and learn...and order the replacement cards from a different printer. For now I'm just going to concentrate on making my personal copies, but I think the idea has a lot of potential. It's not only a great prop, but an excellent notebook in and of itself. If I do go ahead with doing a run of them they'll have some appropriate inserts, like newspaper clippings, sketches, and photos, tucked into the paper pocket on the back cover. I stumbled across this "Y'Golonac Box" while searching through completed auctions on Ebay. It's a good example of theming the presentation of a prop, starting with the Y'Golonac statue and then developing a number of documents and accessories to enhance it's believability. The one thing I really liked about this presentation was the detail work with the sigil and tentacles that was added to the wicker suitcase with Sculpey. What I didn't like was the suitcase itself- fresh off the shelf at "Pier One" or "Big Lots" without a hint of wear or weathering. I've said before that one of the biggest problems with my own efforts is that I don't weather things nearly enough, so please don't think I'm singling out the creator of this piece for criticism. A good example for comparison is the thing in a bottle tutorial. Even though I went out of my way to make it filthy I pulled back out of a misguided fear of "screwing it up" in the end. Logically, that makes no sense. It's an old bottle! It's supposed to be grubby and grimy! But when you've spent hours getting things just right it takes a leap of faith to start slathering on the oil-based stain and charcoal dust. 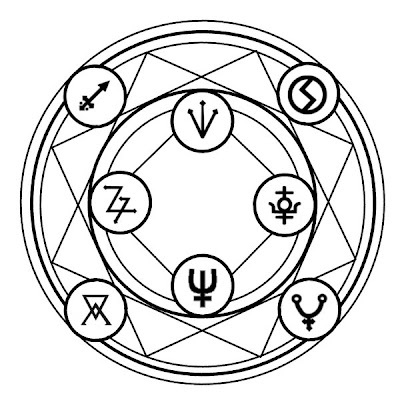 Just the thing to dress up a last minute scroll: a handy summoning circle from kaitou-kage on deviantART. Yet another set of handy brushes, this time a collection of gnarly, evil tentacles for use in Adobe Illustrator. Courtesy of Pebe1234 on deviantART. "Bioshock" was one of the best video games of the last few years, notable not only for it's detailed backstory but for the phenomenal design work inspired by the architecture and advertising of the 30's and 40's. A sequel is due out next year and, inevitably, there's now a promotional site/alternate reality game: There's Something in the Sea. In and of itself that's not very interesting. 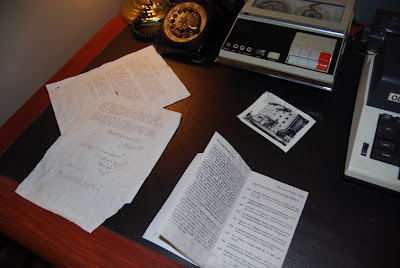 What caught my attention was the full-scale investigators office they had on display at Comic-Con, complete with audio recordings, maps, documents, newspaper clippings, and evidence samples. Joystiq has an entire gallery dedicated to peering into all the nooks and crannies of the room , and the attention to detail is quite impressive. It's not directly tome related, but Jon Decker was nice enough to give me a heads-up about a Photoshop brush set of archaic maps he posted on his blog. 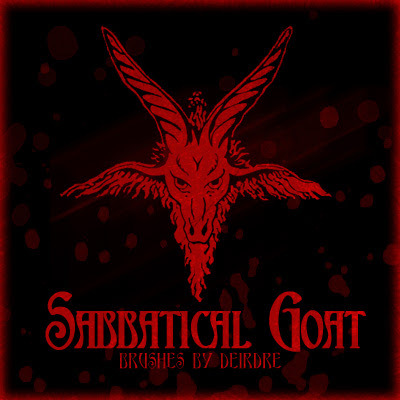 For your quick and easy tome-making pleasure, Deirdre Bardowl has a complete set of sabbatical goat brushes for Photoshop. Those horns, those eyes...that's ol' skool occult goodness, my friends. The skilled crafters at Ravensblight have an incredibly easy to make, yet surprisingly attractive, papercraft version of the Necronomicon. No, it's not some fantastically detailed multi-media recreation, but it is a fun little project. And what better way to introduce innocent children to the dark mysteries of the Mythos? I've discussed Ross MacDonald's incredible work on the "Book of Secrets" for "National Treasure" before, but now you can own your very own copy from the master himself. Mr. MacDonald is taking orders through his online store.